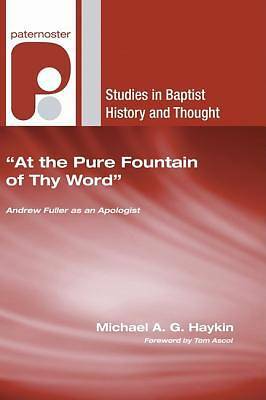 One of the greatest Baptist theologians of the eighteenth and early nineteenth centuries, Andrew Fuller has not had justice done to him. There is little doubt that Fuller's theology lay behind the revitalization of the Baptists in the late eighteenth century and the first few decades of the nineteenth. This collection of essays fills a much-needed gap by examining the major area of Fuller's thought: his work as an apologist. The book argues that the New Testament exegesis, which is at the heart of this reformulation, is fundamentally accurate and that the resulting system is theologically coherent. The book also argues that this view is not a Baptist novelty, but is rather a recovery of the foundational Baptist thought of the seventeenth century. Superb scholarship and absorbing exposition of this extraordinary Christian leader whose thought and contributions to British and American evangelicalism merit careful attention. Christian readers will warm quickly to this set of essays as Fuller's fidelity to truth and evangelistic passion come through in every chapter. --Gregory A. Wills, Southern Baptist Theological Seminary In the context of an extraordinary, busy life as a dedicated pastor and tireless missionary advocate, Andrew Fuller was also an indefatigable writer with an alert mind. These lucid, scholarly essays expand his perceptive interaction with a number of important doctrinal themes, reminding us of our continuing debt to a self-taught but highly gifted evangelical theologian. --Raymond Brown, former Principal of Spurgeon's College, London Until recently, Andrew Fuller, arguably the most influential pastor-theologian in Baptist history, has been the victim of affectionate obscurity, often praised but little read or understood. Now here is a collection of first-rate, scholarly essays about Fuller which helps us both to place him in the context of his times and to sit at his feet as an enduring teacher of the church. A stellar example of Baptist ressourcement --Timothy George, Beeson Divinity School of Samford University Andrew Fuller, more than any other man, defined the theological position that was to be adopted by most Baptists for long into the nineteenth century. Here a collection of fresh essays examines how he defended his version of Evangelical Calvinism against Deists, Socinians and Universalists, against Sandemanians, antinomians and high Calvinists, and against Arminians, a fellow Baptist and critics of Baptist missions. --David Bebbington, University of Stirling Michael A. G. Haykin is Principal and Professor of Church History and Reformed Spirituality at Toronto Baptist Seminary and Bible College.